Roger A. Baumann, 79, of River Road and Baumann’s Meat Market, Waubeka died Friday, March 20, 2009 at Tidewell Hospice House in Bradenton, Florida. He was born February 26, 1930 in West Bend, WI to Feodor and Loraine Norman Baumann. He was a life long resident of Waubeka and married Betty Woodyard on October 22, 1953. He served in the United States Marine Corps from 1951 to 1954. He attended the National School of Meat Cutting in Toledo, Ohio and worked at Baumann’s Food Market as a meat cutter. He was a life member of the Waubeka Fire Department and a member of the Warren-Kane American Legion Post 410. Roger is survived by his wife Betty, children Bob Baumann of Bradenton, FL, Glenn (Bonnie Keller) Baumann of Fredonia, Lori (David) Preisler of Fredonia and Cheryl Lorge of Bradenton, FL, further survived by grandchildren Ryan (Jackie) Lorge, Nic Lorge, Heidi Baumann, Tracy Baumann, Amber Preisler and Matt Preisler, great-grandchild Lleyton Allen, brother Clifford (LeeRaye) Baumann of Fredonia, nieces, nephews, other relatives and friends. Rev. 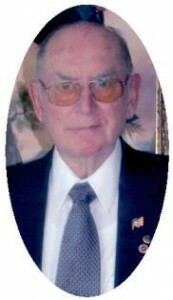 George Schowalter will officiate funeral services 6 pm Friday, May 15, 2009 at the Poole Funeral Home, Port Washington. Interment St. Paul’s Cemetery, Waubeka. Visitation 3 – 6 pm Friday at the funeral home with a 5:30 pm Legion walkthrough. Interment St. Paul’s Community Cemetery, Waubeka 10AM Sat. May 16, 2009.